But back to a recipe. 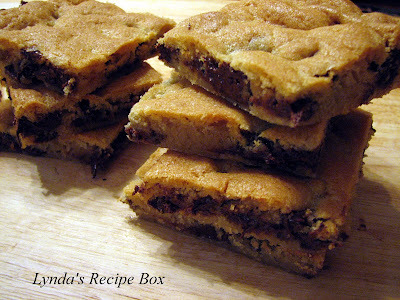 I pulled this one out of the past as this cookie bar was a favorite of my children and the neighborhood kids when they were all young and busy playing outside. My daughter asked me the other day how come I hadn't made these in so long. Truth is, I had forgotten about them for awhile, but after making them yesterday, all three of my adult children were very happy with me! And my DIL loved them. I just assumed that everyone has made these, since it is an older recipe put out by Nestle years ago. 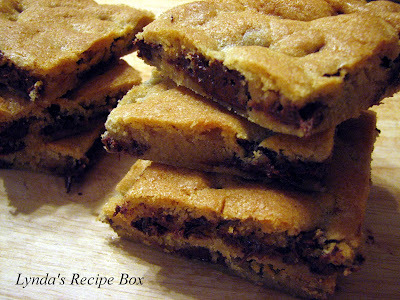 These Toll House Pan Cookies helped me create some great memories for my kids. Maybe you will like them too! Preheat oven to 375 degrees. 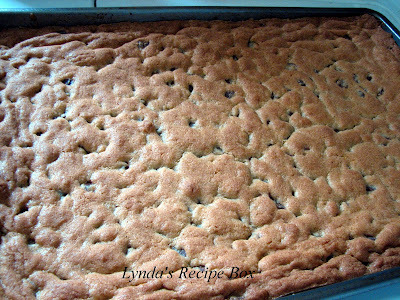 Spray a 15x10x1 inch baking pan with baking spray. In a small bowl, mix the flour, salt and baking soda. In a large bowl, mix the butter, both sugars and vanilla until creamy. Beat in the eggs. Gradually add the flour mixture; mix well. Stir in the chocolate chips and nuts. Spread into the baking pan and bake at 375 for 20-25 minutes. Cool and cut into squares. Ha, they usually don't get a chance to cool! But with these bars, they're good warm or cool. These bars are a great anytime snack for young or old! And it's a quick way to have homemade chocolate chip cookies and fulfill your cravings! Bar cookies are the way to go in the summer when it's too hot to have the oven on for very long. Enjoy! UPDATE: I had incorrectly put the flour down as 2 2/4 cups, but have changed it to 2 1/4 cups; hope I don't mess anyone up! Lynda, I've bookmarked this recipe. My grandsons will be visiting and that will be my excuse for making these. Lynda, I too, had forgotten all about these favorites! Terrific post. Thank you so much for reminding us of these. Your bars look so chocolaty delicious! It's been a very long time since I've made these bar cookies as well. I remember liking them better. Thanks for the reminder. WOW I have never heard of this but I cannot wait to try it. Thanks for sharing! Such tasty looking bar cookies! I would love to try making these! My kidlets would love them! One of my favorite all timers-everyone loves these!It has been awhile since I made this recipe.....you have inspired me! wonderful looking cookies....yumyum...and choco chips..you can't go wrong with that! I've made this recipe many times, but had also forgotten about it until reading your post! I may have to make them again soon!